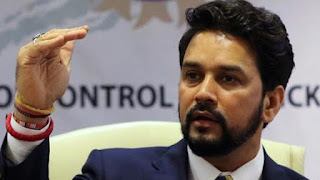 Supreme Court has removed Anurag Thakur from the post of Board of Control for Cricket in India (BCCI) President for allegedly lying on oath. SC questioned why proceedings against Thakur for perjury should not be initiated. Ajay Shirke has also been removed from the post of BCCI Secretary by SC. Meanwhile, SC also issued contempt notice to Thakur. The apex court has said committee of administrator will look after the affairs of BCCI. The Lodha Committee, appointed by the Supreme Court after a betting scandal in the Indian Premier League, has recommended sweeping changes in the way the board is run and led and has complained that the BCCI or Board of Control for Cricket in India is refusing to implement them. The board has pleaded that it cannot implement all the reforms, which include large-scale structural and management changes including retirement of all office bearers as they cross the age of 70 years.